From 1983 to 1999, Sanford wines were produced in a small facility in Buellton by Richard's winemaker, Bruno D'Alfonso. In 2000, A unique, adobe-based, all natural materials-built winery was constructed which Richard described as follows. "The facility was integrated with strong environmental principals and elements of certain Eastern philosophies, particularly the Chinese concept of Tao - emphasizing simplicity." He was eventually to lose this winery, but his influence has never been diminished. Sanford was born on the Hawaiian island of Oahu in 1941, the son of a naval officer. While his father fought the war in the Pacific, the family relocated to California to a home in Rolling Hills on the Palos Verdes Peninsula. His father suffered a serious injury while on board a Korean War-bound ship in San Francisco Bay that was struck by a freighter and was never the same mentally. This came at the tender age of 9 for Sanford. His father was to commit suicide two decades later. He attended El Segundo High School and worked for the merchant marine. He first studied at University of California at Santa Barbara, but was more interested in geography and transferred to University of California at Berkeley which offered classes in this field of study. After graduating in 1965, he served in the U.S. Navy where he worked as a navigator on a destroyer stationed off the coast of North Viet Nam. He was opposed to the war and hitched many rides on military courier planes to see the world. Once back in California, he sailed competitively in Santa Barbara and was introduced to people who might be interested in investing in a vineyard. He also met Thekla in a sailboat. He started a company that produced educational videotapes, but he disliked the Hollywood types he had to deal with. He wanted to work outside and be more "earthly connected." Sanford likes to tell the story of when he was given a bottle of Volnay from Burgundy while in the Navy. The was an epiphany and he fell in love with Pinot Noir. He found, however, that Pinot Noir from warmer areas in California were too heavy. He studied years of weather reports from Burgundy and cross-referenced with California to locate similarities. 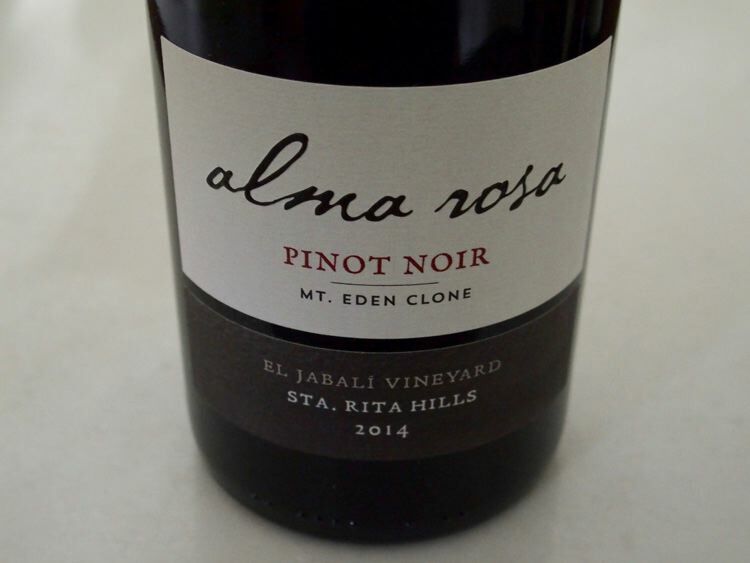 His search for a proper region to grow Pinot Noir found him in what is now known as the Sta. Rita Hills. He laughs when he remembers driving up and down Highway 246 between Buellton and Lompoc holding a thermometer out the window of his car as he took temperature readings. Sanford realized that the climate was unique because of the west-to-east lying transverse range of mountains that led to significant maritime influence. He noted that the average temperature rose about one degree for each mile he drove inland. He was also interested in Edna Valley and Los Alamos. Most people at the time thought that Pinot Noir could not be grown this far south. Sanford ended up coming to the Sta. Rita Hills for reasons of climate only and settled on a site which eventually became Sanford & Benedict Vineyard. He teamed up with botanist Michael Benedict and raised money through investors in Southern California who were members of the wine committee at the Los Angeles Country Club. The pair bought a 473-acre piece of Rancho Santa Rosa that had once been dry-farmed for beans and barley. In 1971, the 120-acre Sanford & Benedict Vineyard along Santa Rosa Road was planted with Pinot Noir, Chardonnay, Riesling, Merlot and Cabernet Sauvignon. Sanford's contribution was sweat equity involved in the planting. Sanford became a winegrower immediately and learned on the job. A makeshift winery was established in an old barn on the property. Open top fermenters were built out of white oak. Thekla had moved to the vineyard to be with Sanford in time for the first harvest in 1976, and they would eventually get married at the vineyard in 1978. Sanford's first Pinot Noir was received with enthusiasm by wine critics and Robert Lawrence Balzar wrote an article titled, "American Grand Cru in a Lompoc Barn." Some consider the Sanford Sanford & Benedict Vineyard Pinot Noir to be one of the seminal wines in California wine history. The partners had a falling out by 1980 and the two parted ways with Benedict retaining ownership of the vineyard. The Sanfords would regain ownership of the Sanford & Benedict Vineyard in 1990. The Sanfords founded Sanford Winery in 1981, at first sourcing grapes from other vineyards. In 1983, a former Buellton warehouse became their winemaking facility and they hired Bruno D'Alfonso as their winemaker (who was to stay for 25 years). A new vineyard was planted on their Rancho El Jabali property and was one of the first in the region to be farmed organically and the Sanford-owned vineyards were to be the first organically certified in Santa Barbara County. Until his venture, most of the winegrowers in Santa Barbara County sold their fruit in bulk to northern California producers who incorporated the grapes into bulk blends and inexpensive wines. Sanford realized that he had to be in control of his own vineyards. In 1995, the La Rinconada Vineyard was planted and in 2000, he plantedLa Encantada Vineyard. The Sanfords were farming about 450 acres of organic vineyards and making nearly 50,000 cases of wine. Beginning in 2002, a number of events played out (the cost of building a new winery proved to double during construction, September 11th happened, bad harvests followed) and Richard lost his namesake winery to his business partners at Sanford (Terlato Family and Paterno Wines), but retained ownership of the El Jabali Vineyard adjacent to the tasting room, assumed a lease on the La Encantada Vineyard, and began a new venture, Alma Rosa Vineyards & Winery. 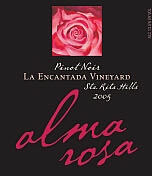 Alma Rosa was based on the home ranch and vineyard El Jabali, and released its first wines in 2004. The name comes from "alma," which means "soul" in Spanish. 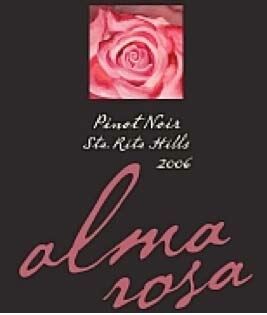 Bruno d'Alphonso left to start his own label, and Christan Roguenant was brought on as the winemaker at Alma Rosa. Alma Rosa reacquired the original tasting room (pictured right) located on the Sanford's home ranch. The loss of Sanford Winery was understandably devastating to Richard and Thekla and their family, but they loved the wine business and became invested in their new winery with gusto. 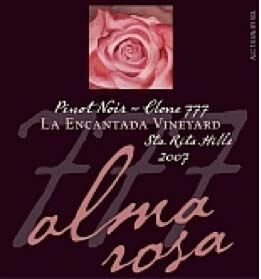 In 2015, Nick de Luca joined Alma Rosa Winery & Vineyards as winemaker, and works alongside Richard Sanford who is the director of winemaking. De Luca came from Dierberg and Star Lane. The Sanfords have a new business partner, Robert Zorich, and are building a zero carbon wine facility at El Jabali. In addition, a beautiful new tasting facility opened in Buellton. The tasting room lacks the usual bar, replacing it with comfortable seating and tasting provided by a host. The ambiance comes from the Swan Hill olive tree in the tasting room's center, the large fireplace, and the construction from salvaged Douglas Fir harvested in 1912. Richard was instrumental in obtaining recognition of Sta. Rita Hills as a distinct American Viticultural Area. His legacy is assured, even though the Sanford Winery website fails to recognize Richard or Thekla Sanford for any of their founding achievements. Richard and Thekla have shown an untiring devotion to charitable work and commitment to conservation, sustainability and altruistic endeavors. Sanford was the first person from the Central Coast of California to be inducted into the Vintners Hall of Fame. Sanford's career has been an economic, emotional and psychological struggle. 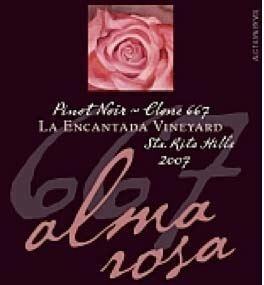 In 2012, Alma Rosa Vineyards & Winery filed for bankruptcy, but the winery operations continued unchanged, producing about 15,000 cases of wine annually. In 2014, Bob Zorich bought Alma Rosa Winery & Vineyards, but kept Richard and Thekla Sanford at the helm with their daughter Blakeney joining them. Remarkably, Richard still attends many winemaker dinners and festivals, promoting his wines face-to-face. In 2012, Richard was inducted into the Vintner's Hall of Fame. 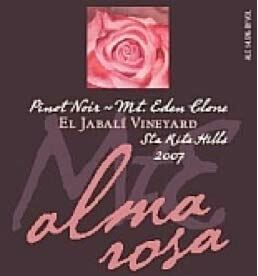 Alma Rosa produces estate Pinot Noir from El Jabali Vineyard and La Encantada Vineyard, both of which are in the Sta. Rita Hills AVA and are certified organic. The Sanfords were the first winegrowers in Santa Barbara County to have California Certified Organic Farming (CCOF) certified vineyards and are steadfast in this commitment. Of the 44 people enshrined in the Vintners Hall of Fame (housed in the Culinary Institute of America in Napa), Richard is the only one who has made his career in Santa Barbara. Much of the history above was gleamed from an article in the Santa Barbara Independent (April 19-26, 2012) written by Matt Kettman, "Visionary Vintner: Richard Sanford's Rise to Winemaking Royalty." A new, modern tasting room opened March 7, 2015, at 181-C Industrial Way in Buellton, the gateway to the Sta. Rita Hills. the tasting room is an elegant take on reused and natural materials.